Here I'll describe the basic Otocinclus anatomy. Most fish have similar fins and other body parts as the oto, just not in the same places. 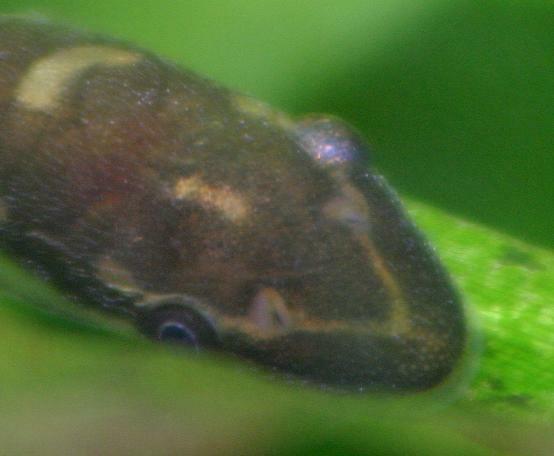 Either way, the otocinclus is like other catfish in the family Loricariidae (Suckermouth catfishes) so this could also describe the other species, such as pleco, paraotocinclus, and farlowella. Sure we could keep up the scientific analysis of scales and gill plates, and other such stuff. 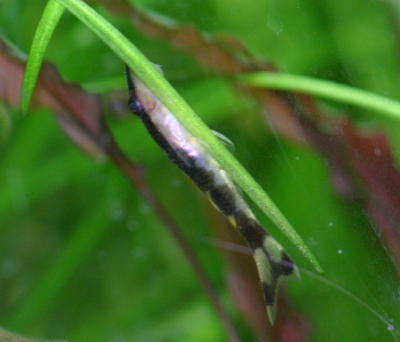 But I'm interested in what makes these otocinclus catfish so COOL! Lets have a look at the parts of the otocinclus which make them interesting. What? Does this poor fish have "hole in the head" disease? No... they're nostrils! 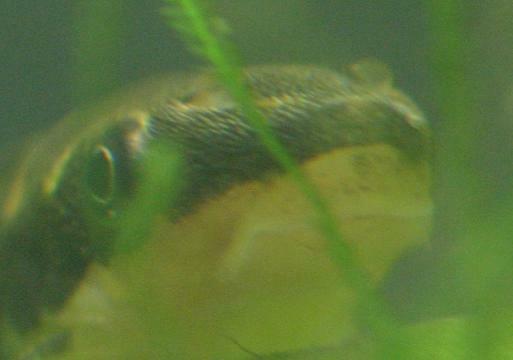 Otocinclus use their nostrils to locate food from across the tank. It's most likely that your oto is SMELLING the algae tablet you placed in one corner, rather than seeing it right away. This picture isn't flipped... that is an otocinclus hanging upside down by its ventral fins! The oto uses these fins as little hands to hold it steady on thin leaves (such as the pygmy chain swords pictured above.) It will also sometimes rest on these fins so its stomach doesn't touch the gravel or plant leaf... almost like a balancing act! 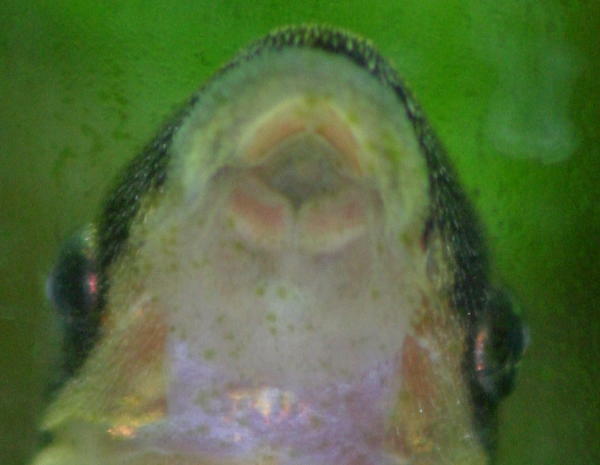 A closeup of an otocinclus mouth shows you the two "whiskers" of the catfish. This also shows the closest thing you'd ever find on an otocinclus that resembles teeth. It takes those four mouth parts and rubs them against the surface to remove the algae, kind of like a scrubby pad. Fish have hairs? Well, the otocinclus do! They have these small hair-like protrusions from the skin. They're called odontodes, and they are actually made of bone material. I'm still trying to find out what they are used for (probably deterring predators and maybe mating), but I know that these hairs can cause the otocinclus to get stuck in a fishnet, so be careful!